This species is accepted, and its native range is Andaman Islands (incl. Coco Islands), Nicobar Islands. Flowering November - December. Fruiting April-May. Solitary, large diameter rattan. Stem 24 m long or more, with sheaths to 8 cm in diameter, without sheaths to 4.5 cm, straw - yellow when exposed. Leaf 4 m long, cirrate; sheath slightly pale yellow, turning reddish brown, thick woody, with minute bristle like spines: spines upto 0.3 cm long, arranged in comb- like narrow crests, deciduous, mouth of the sheath with spines to 1.2 cm long; knee present; ocrea indistinct; petiole very robust, upto 5 cm broad at the base, with small spines on the margins; spines upto 0.4 cm long, often interspersed with a few smaller ones; rachis spiny along the margins and along the adaxial side at the distal end; leaflets 32-51 x 2.5-4 cm, regular, midvein prominent, lateral veins bristly on the upper surface; bristles 0.7 cm long; midvein and two lateral veins bristly on the lower surface, bristles of the midvein longer; margins with small spines; cirrus with whorls of 4-7 black tipped claws. Inflorescence erect; male inflorescence 1.25 m long, panicled: primary sheath tubular, 8-10 cm long, slightly enlarged above, the upper ones longitudinally split, sparingly armed with prickles; partial inflorescence to 80 cm long, twice branched; secondary sheaths unarmed, rachillae 2-2.5 cm long, often arched, with 15-20 bifarious flowers on each side; female inflorescence flaglliferous or not, primary sheath not tightly sheathing, armed with spines to 0.6 cm long; partial inflorescence 30 cm long: secondary sheath upper part splits open: rachillae 4-6 cm long, involucre cup-shaped. Fruit elliptic ovoid, ca. 1.4 x 0.9 cm; scales in 17 vertical rows, brown with dark brown border, slightly channelled, having an appendage of 0.3 cm long at the apex; endosperm not ruminate. In evergreen forests upto 260 m; Andaman and Nicobar Islands. (Maps 2-4). Solitary, large diameter rattan. Stem to 15 m long, basal part stand erect, rest climbing, with sheaths 5 cm in diameter without sheaths 3 cm in diameter, basal nodes with exposed roots. Leaves 2 m long, cirratejuvenile leaf not cirrate; sheath yellow, armed with spines; spines jet black, in tufts below the knee, arranged on a raised rim in semicircles, mouth of the sheath with longer spines; knee present; ocrea not seen; petiole armed with black spines: rachis with small spines to 0.5 cm long: leaflets c.o. 55 x 3.5 cm, regular, linear lanceolate, 3 veined, veins ciliate on the ventral side, cilia to 0.8 cm long. Inflorescence long flagellate; primary sheath upper part papery; partial inflorescence 50 cm long; secondary sheath upper part papery; splits open; involucrophorum present, involucre cup shaped; fruiting perianth stalked. Fruit ovoid - elliptic, ca. 1.5x1 cm; scales in 15 vertical rows, brown with light brown margin, not channelled in the middle; endosperm not ruminate. Evergreen forests at Car Nicobar (Map 3). Flowering November - December. Fruiting April - May. Calamus semierectus Renuka & Vijayak. Extensively used in furniture industry. Leaves are used for thatching. Used in the construction of huts. Sreekumar, V.B. & Henderson, A. (2014). 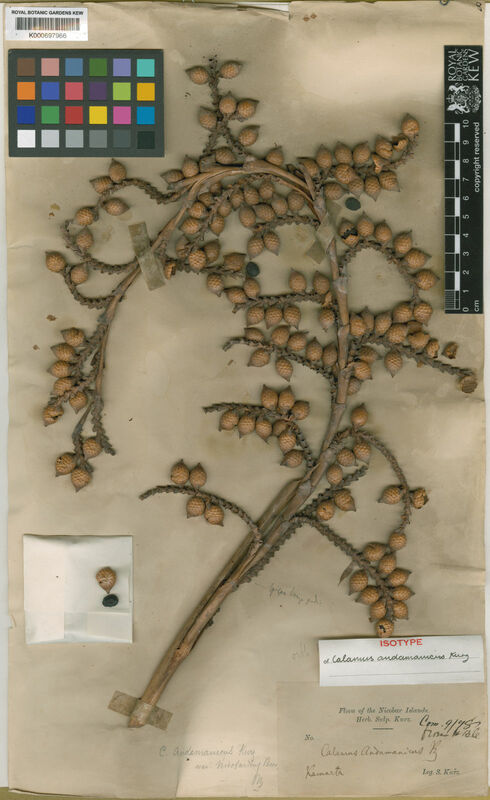 Nomenclatural notes on Indian Calamus (Arecaceae) Phytotaxa 166: 145-149.